Last year, life was grand in Atlantic City. 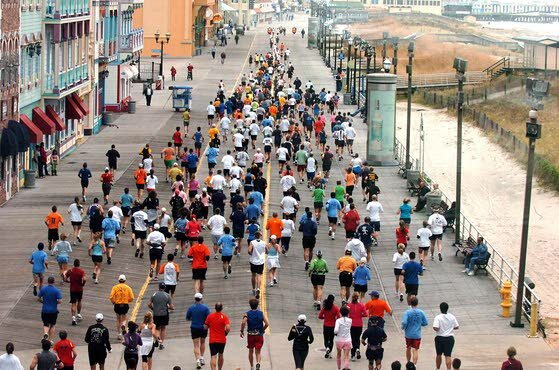 I ran a half marathon, and the city had 13 casinos. Since then, we’ve both downgraded: I’m running half the distance, and Atlantic City has nearly half as many casinos. This is my first trip to AC since the massive bloodletting of September, where Revel, Showboat, and Trump Plaza closed their doors. All reports I’ve heard about Atlantic City the last month made it sound exactly like the town Bruce Springsteen sang about on Nebraska. But, still, I had to go down there and see it for myself. We are also not staying at a casino, but at the Chelsea Hotel, a funky hotel with pink neon lights, situated right next to the Tropicana. It was easily the cheapest hotel I could find in AC that didn’t look like I’d find a severed head in the toilet. My room had a cracked mirror and a wine bottle in the mini-bar that looked like it had been opened then resealed. So, yes, I’d give the Chelsea two thumbs up, and would stay there again. Keith Stone: After a bus trip filled with the usual drinking of liquor out of soda bottles, practicing blackjack on my phone, and old ladies politely ignoring our inappropriate conversations, Realtor and I had a little less than half a bottle of vodka left upon arrival at the Chelsea. We agreed to meet Rory and Mrs. Rory downstairs in about 20 minutes. I’m not exactly sure where all the vodka went but it was gone by then. My high school cross country coach always did stress the importance of hydrating the night before a race.